The 45 RPM Analogue Productions reissue of Stevie Ray Vaughan's Texas Flood is so good, as are its 45 RPM companions — Couldn't Stand The Weather and Soul To Soul — that they truly represent what Gregg Geller, producer and A&R representative described as "the best replication of the master tapes to date." We've already brought you the 33 1/3 RPM box set Texas Hurricane featuring the greatest Stevie Ray Vaughan tribute ever reissued — six of Vaughan's most classic album titles remastered for ultimate blues and guitar fanatics. We've now taken the extra step and done 45 RPM versions of these three standout LPs. We've used the original 30 inches-per-second, half-inch analog master tapes for all of these albums. Ryan K. Smith at Sterling Sound cut the lacquers for the LPs using the ultimate VMS 80 cutting lathe. Gary Salstrom handled the plating and the vinyl was pressed of course at our Quality Record Pressings, maker of the world's finest-sounding LPs. Stevie Ray Vaughan's 1983 debut album, Texas Flood, was a phenomenal success, climbing into the Top 40 and spending over half a year on the charts, which was practically unheard of for a blues recording. The record plays like a dynamite club show, filled with crowd-pleasing originals and covers, all performed with unbridled enthusiasm. 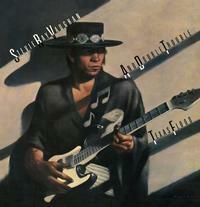 Texas Flood was certified gold on August 13, 1990, and certified platinum on January 22, 1992. There's not a link in this production chain that wasn't absolute first-rate. The absolute best that money can buy. But beyond that we've poured our passion into this project. Acoustic Sounds is a big fan of the blues and Stevie Ray Vaughan. It's a big dream come true to work on this project and to make these records sound and look the best they ever have. If you are into blues and jazz, like me, then you probably have a lot of this music already. I have all of SRV's work on CD, and I've converted all the CD's to MP3 Files. So I wondered if it would worth it to pay $55 for yet another copy of this album. If you are wondering the same thing, the answer is "yes." The sound quality is so good you will find yourself rediscovering this music, and listening to these albums all over again. That's not true for all the reissue LP's that are out there now. You need to read the reviews. Some aren't that impressive, even in 200g 45 rpm pressings. But I assure you, you will be impressed by this series. I bought this album, and now I'm buying the rest. It is absolutely outstanding. Enjoy!